Guitarist Chris Thomas King’s career has taken a long and winding road from Louisiana to Europe and back again. In 1979, when he was just 17, King was hailed by folklorists as “the last major folk blues discovery of the 20th Century.” He later ditched this style along with the whole notion of authenticity in the blues, embracing instead “hip hop modernity and digital aesthetics.” The backlash from (primarily white) blues audiences compelled him to move to Europe in 1993. Ironically, when he returned several years later, King was once again cast as an “authentic” Delta blues guitarist—this time on the silver screen―as “Tommy Johnson” in the Coen Brothers’ film O Brother, Where Art Thou? (2000), as Blind Willie Johnson in Martin Scorsese’s The Blues (2003), and as Lowell Fulson in the Ray Charles biopic Ray (2004). These days King assumes total artistic control over his projects which are released on his 21st Century Blues label. 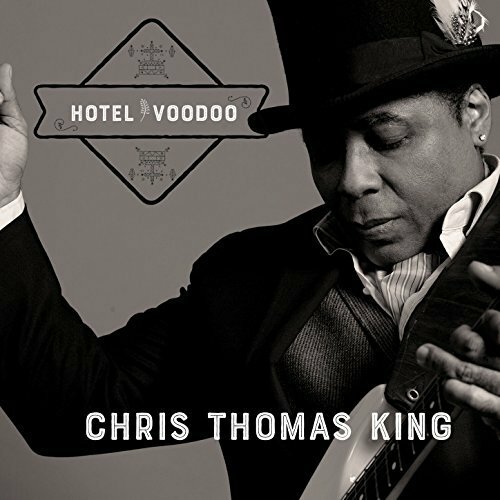 Hotel Voodoo, his first new studio album in five years, features his touring band members Jeff Mills (drums) and Danny Infante (bass guitar), along with a few additional New Orleans musicians. The bulk of the album, however, is a showcase for the multitalented King, who performs all vocals along with the majority of instruments including electric and acoustic guitars, accordion, harmonica, mandolin, banjo, bass, and piano. With the popularity of vinyl on the rise, King conceived this album as two suites, covering side A and B of a LP, rather than the strictly linear CD sequence. Side A is the “Baron Samedi Suite,” referencing the Loa spirit (aka lord of the crossroads) in Voodoo religion, while Side B is the “Jelly Roll Suite,” linking New Orleans’ jazz and blues traditions. The styles of the nine original songs and one cover are as varied as the titles of the suites suggest. As his alter ego Baron Samedi (wearing black top hat and tuxedo), King is the consummate blues-rocker. Opening with “American Man (In the Key of Free),” he sings about the American dream in this upbeat, retro-styled song with overdubbed background vocals adding just a touch of contemporary club vibe. Digging deeper into the Samedi theme on “Voodoo Child (On Hell’s Highway),” he whips out his Fender Stratocaster and adds enough reverb and electrifying solos to appease the spirits. “Friday Night Bleu” and “Have You Seen My Princess?” are straight ahead blues tracks, showcasing King’s prowess as an electric blues guitarist and his ability to single handedly cover all instruments and drum programming. Flipping over to the piano suite “B” side, CTK conjures an entirely different atmosphere, recreating the feel of an acoustic set in a traditional NOLA jazz club. The first two tracks pay homage to the clarinet, an “essential solo instrument in New Orleans blues” 100 years ago. Owen Callahan is the featured clarinetist on the opening track, “Les Bleus Was Born in Louisiana,” while Gregory Agid takes over on “White Folks Call It Jazz,” with Nathan Lambertson on upright bass (yes, there is a not-so-subliminal message here about the true roots of the blues). The heartfelt “Tabby’s on the Bayou” is about nights at Tabby’s Blues Box, his dad’s “ramshackle juke joint, before it was razed by the city of Baton Rouge in 1999.” CTK swaps his guitar for an upright piano, with shuffling second-line rhythms adding to the ambiance. After enjoying all of these original songs, the acoustic cover of Adele’s “Someone Like You” is somewhat incongruous (CTK previously recorded “Rolling in the Deep” in a more compelling blues rock arrangement). Likewise, the closing track “Rainbow Lullaby” is a nice folksy tune with harmonica, mandolin, and banjo, but doesn’t reinforce the “Jelly Roll Suite” concept. Hotel Voodoo allows Chris Thomas King to display his formidable talents and wide-ranging musical interests. The album’s overarching theme is King’s love of Louisiana, and the blues and jazz conjured from the juke joints of the bayous and streets of New Orleans. This entry was posted in Blues, Popular, Rock, and Misc. and tagged Baron Samedi, blues guitar, blues rock, Brenda Nelson-Strauss, CD review, Chris Thomas King, Hotel Voodoo, Jazz, Jelly Roll Morton, New Orleans by aaamc. Bookmark the permalink.